After several years of significant growth, Driven, Inc.—an e-discovery service provider—was ready to make their initial foray into advertising. But first they needed to evolve their identity. We designed Driven’s new logo to convey the feel of a calm, cool, tech savvy company customers could count on. The logo itself also includes a reference to the number “1,” or “ONE”, Driven’s software platform. By incorporating their flagship product into the logo of the overall brand, we solved a larger issue the company was facing—disparity between awareness of the platform and the company who made it. 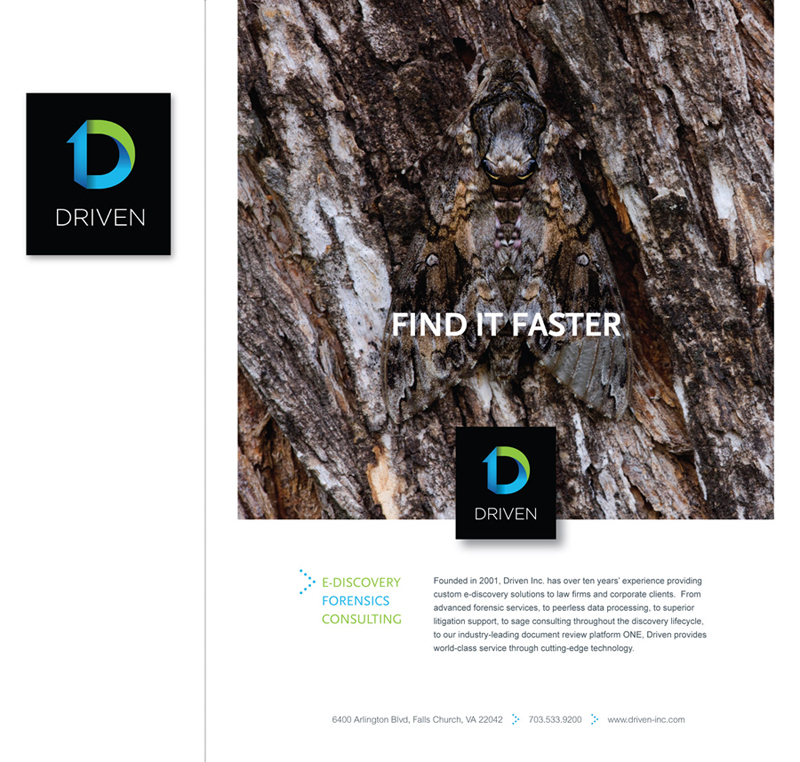 For Driven’s first print campaign, we positioned them uniquely within the e-discovery space by focusing on natural imagery (specifically, natural camouflage). When it comes to advertising, the majority of the e-discovery companies use on tech-heavy imagery and promises of speed and performance. So, when we began running full-page print ads using similar messaging (i.e. “Find it faster.”) paired with examples of natural camouflage, the response was immediate and significant.